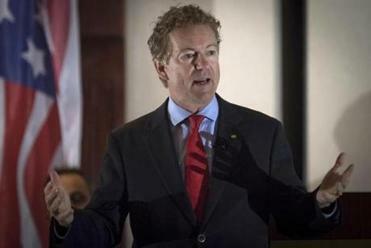 US Senator Rand Paul, Republican of Kentucky, suffered five broken ribs when he was attacked Friday. BOWLING GREEN, Ky. — Senator Rand Paul, Republican of Kentucky, is recovering from five broken ribs and bruises to his lungs, and it is unclear when he will return to Washington, aides said Sunday, signaling that injuries he sustained Friday are far more severe than initially thought. The second-term senator and 2016 presidential candidate was allegedly attacked by a next-door neighbor, Rene Boucher, 59, who was charged with fourth-degree assault. Doug Stafford, Paul’s chief of staff, said in a statement Sunday that the senator has five rib fractures, including three displaced fractures, meaning the bones are partly or completely cracked. ‘‘This type of injury is caused by high velocity severe force. It is not clear exactly how soon he will return to work, as the pain is considerable as is the difficulty in getting around, including flying,’’ Stafford said. Kentucky State Police charged 59-year-old Rene Boucher, Paul’s neighbor, with fourth-degree assault. Paul has lung contusions, or bruises, caused by the broken ribs, Stafford said. He could not say whether one lung was bruised or both, but said Paul’s recovery could last several months. Such fractures can cause other significant medical problems, including internal bleeding, damage to other organs or pneumonia. The nature of the dispute between Paul and Boucher remained a mystery on Sunday to locals who know both men as medical professionals based in this southwestern Kentucky town. David Ciochetty, a doctor with Interventional Pain Specialists in Bowling Green, said in an interview Sunday that Boucher worked there as a ‘‘general pain medicine physician’’ for about a year and a half beginning in January 2010 before leaving because of an unspecified personnel issue. After Boucher left IPS, Ciochetty did not hear of him practicing anywhere else. Paul had full staff privileges at the local hospital when Boucher worked there, so Paul and Boucher ‘‘must have worked together at some point,’’ Ciochetty said. Kentucky State Police had no new information about Boucher on Sunday. He was being held at Warren County jail on $5,000 bond, state police said. ‘‘He was active on social media and said some negative things about the Republican agenda,’’ Jones said. ‘‘I think it was unfortunate that they lived so close together,’’ he added. Boucher’s purported Facebook page included links to articles and memes critical of President Trump and a news article about a Montana Republican congressional candidate who attacked a reporter the day before winning his seat. The page said Boucher is a former Army pain-management specialist and graduated from the College of Osteopathic Medicine in Des Moines in 1984. By late Saturday, the page had been overrun by other Facebook users criticizing Boucher for the alleged assault. On Sunday, the page appeared to be blocked from public view. 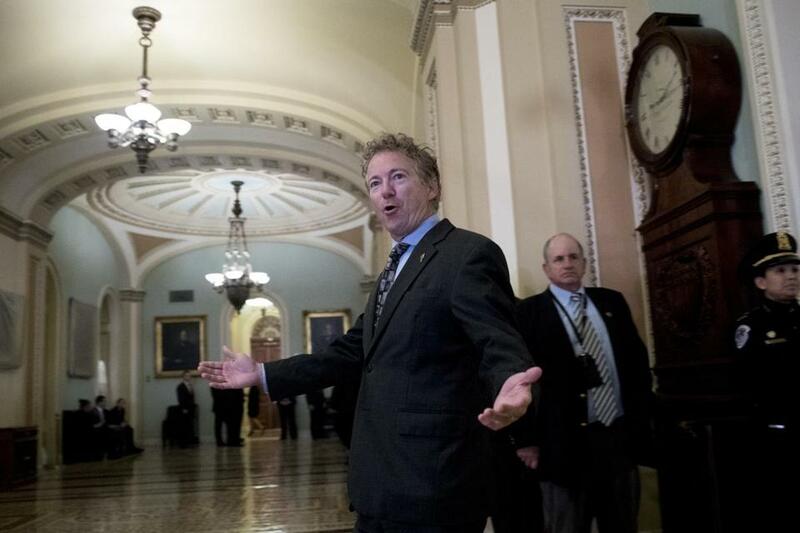 ‘‘He’s pretty much the opposite of Rand Paul in every way,’’ Bullington said in an interview. The neighbors had been known to have ‘‘heated discussions’’ about health care, Bullington said, adding that Boucher is an advocate of a national health system. Paul voted last summer against the Republican plan to repeal the Affordable Care Act, saying the plan didn’t go far enough in repealing the 2010 health-care law. Robert Porter, a friend of Paul’s, said late Saturday that the senator was mowing his lawn moments before the attack. Paul and Boucher live side by side along a small lake in Rivergreen, a close-knit gated community with large houses. On Sunday afternoon, nobody answered at Boucher’s home. Next door at the Paul residence, four people were seen doing yard work. Other neighbors were out walking enjoying the unseasonably warm weather. The senator joins a growing list of lawmakers in both parties who have been attacked or threatened with violence this year. Congressional security officials have investigated thousands of general or specific threats against Democratic and Republican lawmakers. The threats turned to violence during the summer when House Majority Whip Steve Scalise of Louisiana was shot nearly killed by a gunman who showed up at a congressional baseball practice in Alexandria, Va.
More recently, Representative Frederica Wilson, Democrat of Florida, skipped several days of votes after threats were made against her after she sparred with Trump over the treatment of the widow of a US soldier killed in Niger.